CHARLOTTE – A timely pick-six sealed the deal for North Carolina A&T as the Aggies (3-0) were able to pull off an FBS upset for the second year in a row with a 35-31 victory over in-state opponent Charlotte. The 49ers (0-3) dropped their home opener for the first time in the program's five-year history. The announced crowd of 18,651 was the largest ever to see a game at Jerry Richardson Stadium. 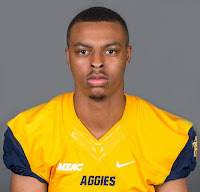 The game started off anything but good for North Carolina A&T as the opening kickoff return was fumbled, setting Charlotte up for a quick three-play drive, culminating with a 14-yard touchdown run by Hasaan Klugh (Central Cabarrus). The Aggie offense showed their mettle, responding with 21 unanswered points over the next fifteen minutes on drives of 90, 71, and 81 yards respectively. A quartet of former North Carolina high school stars was responsible for each of these score as quarterback Lamar Raynard (High Point Andrews) found Malik Wilson (Eastern Alamance) for the Aggies' opening score and Jaquil Capel (West Montgomery) and Marquell Cartwright (High Point Andrews) added rushing touchdowns. Cartwright opened up the second half with another score, but these were the last points the Charlotte defense allowed. The 49ers, who had struggled offensively in their first two games, awoke during the second half as Hassan Klugh passed for three TDs. The 49ers were poised to tie the game or even take the lead late, but Franklin "Mac" McCain's second interception of the night, a 74-yard scamper for the Aggies' final score of the night, saw NC A&T coach Rod Broadway celebrating his team's upset bid. Lamar Raynard led the Aggie offense with 259 yards passing and 61 yards rushing. Marquell Cartwright added 66 yards along with his two scores. Malik Wilson led the NC A&T receiving corps with 84 yards on two receptions, including one touchdown. North Carolina A&T defensive end Darry Johnson forced two fumbles and had a sack and former Goldsboro standout Justin Cates had two sacks. Former high school rivals Benny LeMay (Butler) and Workpeh Kofa (Independence) led the Charlotte offense with LeMay rushing for 158 yards and Kofa's six receptions for 110 yards and a score. Zach Duncan was the star for the 49ers defensively. The former East Forsyth Eagle had two sacks and a forced fumble. Charlotte hosts nonconference opponent Georgia State next week at Jerry Richardson Stadium next week. The 49ers' first ever FBS win was against Georgia State to open the 2015 season. North Carolina A&T travels to Maryland next week to open MEAC play, taking on Morgan State.